Fits 152 CID 3 cylinder or 203 CID 4 cylinder gas or diesel engines. For tractor models 2500, 20, 40, MF135, MF150, 203 and 205 to serial number 659002115, 35, FE35, MF35, MF50, 2135, MF235 engine serial number ending in D, 200B, 4500, MF230, 20C, 30B, MF245, MF250, 356, MF65, 300, 302, 304, 3165, 40B, 50, MF165, MF255. New, aftermarket Crankshaft seal, Front Lip Type, Perkins for sale with a solid manufacturer warranty. 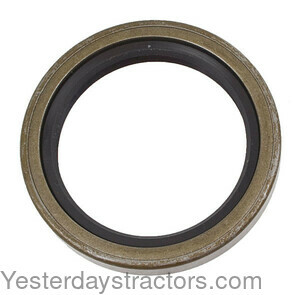 In addition, we have a generous 30-day return policy if this Massey Ferguson Crankshaft seal, Front Lip Type, Perkins for Massey Ferguson Perkins Engines, 2500, 20, 40, 135, 150, 203, 205, 35, FE35, 50, 2135, 235, 20C, 30B, 245, 250, 356, 65, 300, 302, 304, 3165, 40B, 165, 255 tractors needs to be returned for any reason. Please see our Parts Warranty and Return Policy links on your left for complete details before returning.